Hi! Just popping in here to share a little health update and a vlog. I had a hematologist appointment right before Thanksgiving to check my hemoglobin levels post-pregnancy. The doctor prescribed four more iron infusions because I’m nursing Sadie and he doesn’t want either of us to become anemic as she continues to deplete my iron stores. So, I had my fifth iron infusion on Tuesday. I had a lot of fears about iron infusions during pregnancy, and I thought those fears would stop once Sadie arrived, but they kind of transferred over to worrying about her not wanting to nurse, the safety of iron infusions while nursing, and any possible side effects for Sadie. 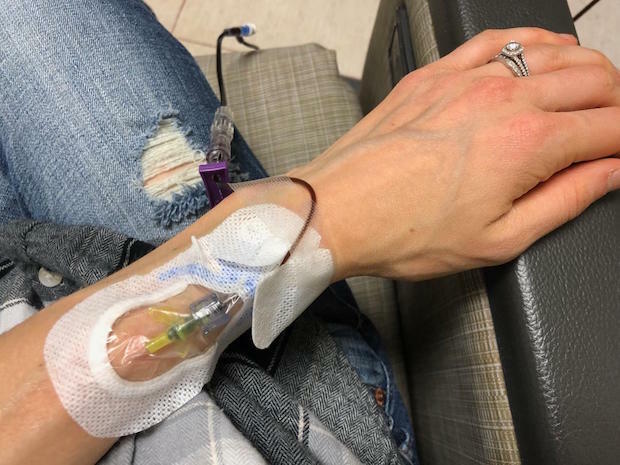 In the days leading up to the infusion I kind of gave myself a pep talk about how the hematologist wouldn’t recommend the infusions if they weren’t necessary–he went to medical school for years and I needed to trust his judgement. I also told myself that I was doing this for Sadie and I to be healthy. It would break my heart if she became anemic. I know how that feels and it’s not fun, lol. I reminded myself how blessed I am to receive great medical care and how I never want to take that for granted. Lastly, God protected Sadie and I during the four infusions we had during pregnancy, why wouldn’t He now? I just wanted to keep it real here on the blog. I don’t love iron infusions and I seem to have new fears with each one, but God is teaching me to trust Him and be thankful. There isn’t a situation that He isn’t in control of, and everything has a purpose. When I look at things that way it makes it a bit easier. I had my usual side effect from the infusion, which is exhaustion for a few days after. It’s Saturday as I type up this post and I’m feeling a lot better, thankfully! Three more infusions to go, and then we’ll check my hemaglobin again in a few months and go from there. I’m so thankful my mom was able to come out and spend the day with us to help me with Sadie at the hospital. I don’t know how I would have done it without her! We decided to make it a girls’ day and even filmed a vlog. I’m not particularly religious, but you had every reason to worry and be concerned- after all, it is your body and now you have Sadie to worry about as well with nursing (granted, she was there the whole time you got infusions when pregnant, but her being in the room now makes so much more difference). Plus infusions like this really do have risks- those risks are rare but there’s a reason why you have them done at an infusion clinic with nurses present, ya know? Anyway- I’m glad you’re handling the anemia and that your doctor is on it! 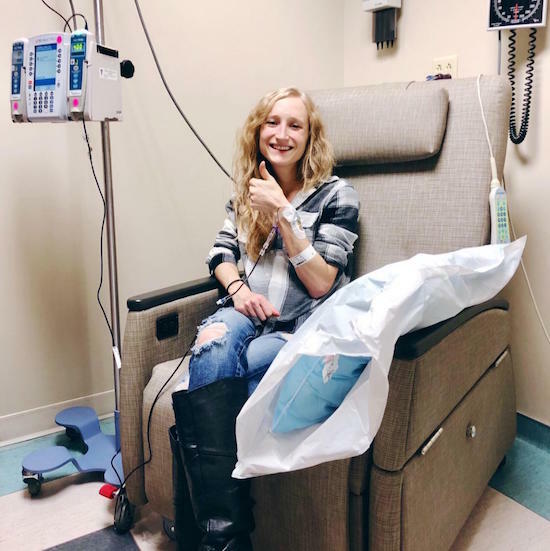 Hopefully this will be your LAST iron infusion experience! And you got a healthy beautiful baby out of it, it is worth it. Aww, thank you, Amy! I definitely was a basket case leading up to the infusion! It’s a lot to think about! Plus, with my sis being in nursing school, she told me about all the risks (and benefits) of iron infusions and it was scary! I’m glad it went well, though! Amen to the healthy beautiful baby! So, so worth it all! So sweet thank you for sharing! She’s so cute with the tiger! We crack up at her smiling at it like crazy! I was soo relieved that Sadie didn’t have any side effects from the infusion! Answered prayers! This was my fifth total (four during pregnancy! ), but I do have three more, so it will end up being four (at least!) after pregnancy! Crazy! It has been quite the experience, haha. Sadie makes the infusions so much better!! She’s totally worth it! Aw Allie, I am SO sorry you are having to still get these infusions- but your perspective is so mature & wise. You are one strong woman! Thanks for keeping us in the loop. I loved watching your video… Sadie is seriously the cutest, my heart is bursting. Also, I was so confused who was driving the car for a few seconds there lol!! Your cookie list looks awesome. Have a great week, girl! Aww, thank you Mackenzie! That is so encouraging! I’m so sorry that you’re still having to get the infusions! What a bummer! I think it’s so great that you’re still so upbeat about it, though, and realizing that it’s just a necessary evil to keep both of you healthy. And you’re right–at least medical treatment like this does exist to prevent any serious problems!! Your vlog was fun to watch, thanks for sharing! Your mom is so cute! She kind of reminds me of Julia Roberts actually. ❤ I'm glad you had a good IV technician too, that makes such a difference! I always feel like no matter how much water I drink, my veins shrink up, which always makes it hard on the tech and painful for me lol.